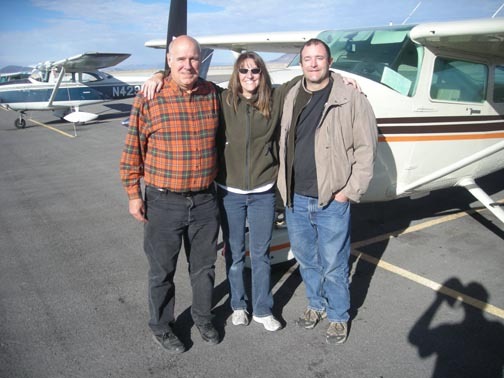 Part 2 of the 2007 trip consisted of flying and driving. Steve (WesternGhostTowns.com), Cat (RipleysGhostTowns.com) and Brian (OffRoadExplores.com) flew over 17 different towns and mines looking for new areas and updating previously visited ones. A fuel stop in Tonopah, Nevada provided an opportunity to have a pleasant lunch with Shawn Hall who's shadow appears in the picture(nvghosttowns.topcities.com). Originally planned as a two day exploration flight, the flying portion was reduced to one day due to inclement weather. The second day then became a ground trip to follow up on some of the sights we had seen from the air. The locations visited during the ground portion are listed in the ghost town section of the home page. Some, but not all of the flight pictures are available on this website. Click on the towns in all capitol letters for the flight pictures. The pictures of the towns visited during the ground trip are located in the town listings on the home page.